Sound Both sound "quick, clear, detailed and exceedingly precise," "with very good image separation and clarity," but "a tad dry" through the midband. Features KA-1 offers 110Wpc, six inputs, an optional phono input, and a headphone jack; KC-1 " has all the standard controls" and two digital outputs; "different colored faceplates" are available for an extra charge. Use Same remote control operates both units. Value "Cost-effective performers that carry on the British tradition for good sound and nice styling and then add a little dash of North American 'featurism' thrown in." Living in Canada gives me an interesting perspective on audio. Our specialty audio stores tend to be rather global in terms of the products they pack. As a result, Canada is somewhat of a haven for "gear heads" because they can see a great cross-section of equipment from North America and abroad, particularly Britain. The British have always had a stronghold on audio in Canada, and most audiophiles here grow up knowing the names of all the overseas manufacturers. Roksan was well known here long ago for their turntables, and then more recently for their electronics, which first included the Caspian series and now this, the newer, more affordable Kandy components (or is that komponents?). 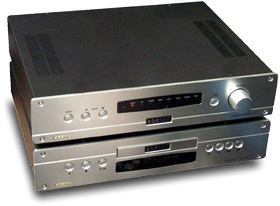 These include the KA-1 integrated amplifier and KC-1 CD player under review; there's also the KT-1 tuner. Components from British manufacturers tend to be a bit smaller than the he-man, behemoth-sized stuff we see from our south-of-the-border friends. In addition, features on the front panels tend to be minimal, and nice styling tends to be a given. Its a gross generalization, but I find that the North American manufacturers tend to make things that are chunky, while the European stuff looks so much more, well, refined. I've been told by more than one person that this is because the living accommodations in Europe tend to be a little compact and, therefore, dedicated listening rooms are more rare and the home-audio system is more of a living-room centerpiece. Therefore, reasonably sized, good-sounding, and nice-looking components are whats needed. Makes sense to me. Roksan says the KA-1 integrated amplifier can deliver 110Wpc at 8 ohms and 170Wpc at 4 ohms, both channels driven. Thats plenty of power, so the KA-1 should be able to drive the majority of speakers potential buyers would want to use. In addition to being a powerhouse at the price, the KA-1 comes with a plethora of features. There are six RCA input jacks for a variety of sources, plus a tape loop -- all selectable via the supplied remote control or front-panel controls. For vinyl aficionados, the third line-level input can be switched to a moving-magnet phono input. But if you dont need phono support, youre not out an input. Theres a headphone jack, 20dB mute control, and all sorts of other things. Like I said, the KA-1 is rich with features. Around back things are carefully laid out. The speaker posts and input jacks are all spaced reasonably far apart given the modest size of the KA-1. Setting up is a snap, and all the connectors are high quality. The power cord is detachable for those who like to play with such things (I experimented with the Shunyatas King Cobra that retails for more than two times the price of this unit alone!). And finally, also on the back side is the main power switch, which you leave on for the long term to keep critical components inside the KA-1 warmed up. On the front panel (as well as the remote control) there is a Mode switch that turns the amp on for daily listening. The only quirky thing here is that when the unit is not ready to play, the front-panel LED is green. When it is ready to play, the LED turns red. For those who associate green with go and red with stop, it will seem backward. But, frankly, this is irrelevant in the scheme of things and something you just get used to. Impressed with its outer shell, I cracked open the KA-1 and took a look inside. The guts match the heavy-duty chassis construction. There is a very large transformer at the front center with the heatsinks flanking each side. The circuit board is in the middle, and everything seems neatly laid out. The quality of construction and attention to detail seem very good. The KC-1 offers everything you could want in terms of CD-playback functionality, which means its has all the standard controls you see on any loaded CD player: track skip, search, time display, and on and on. In terms of the technical details, theres some good stuff too. It uses Burr-Brown 1716 24-bit/96kHz DACs and a Burr-Brown 1716 digital filter. Should you wish to use the KC-1 as a transport only, there are coaxial RCA and TosLink optical outputs on the back. The KC-1 has just one power switch on the back -- no Mode function like the KC-1 -- so you leave it on unless you go away on holidays or wont be using it for a long time. It also features a detachable power cord. The KA-1 and KC-1 are very attractive in terms of design, with a feeling of solidity that I would expect at a much higher price. They each feature an all-metal chassis and 6mm-thick aluminum faceplate. A single remote control operates both effectively. The KA-1 and KC-1 are formidably priced at $895 USD each with the standard silver faceplate. But there's more about the faceplate that helps the Kandy name make more sense. You can get different colored faceplates in metallic finishes (green, purple, navy) and in automotive-type finishes (pink and black). This may seem like a moot point to some, but for those with a flair for the appearance of components, the Kandy systems alternate-color faceplates can help make quite a statement. A faceplate can be had for $80 per component at the time of purchase, or for an additional $20 surcharge on top of the $80 if ordered after that. I think having this flexibility is pretty darn cool. I used both pieces to drive Mirages $2000 OM-7 loudspeakers. Speaker cabling was Magnan Signature and interconnects were custom-made by Blue Circle with Eichmann Bullet Plug RCA connectors. As mentioned, I substituted Shunyatas King Cobra power cord on the KA-1 just for fun. However, I left the system largely tweak free, thinking that prospective purchasers will likely want to use these in "stock" form. For comparison I had on hand only gear that cost more than the Kandy duo: Blue Circle BC8 mono amps and BC3000 preamp, and the Audio Aero Prima 24/192 CD player. Quick, clear, detailed and exceedingly precise, the KA-1 integrated amplifier proved a good match for the Mirage speakers, which seem to prefer a "tight"-sounding amp with enough power to take control and get them up to good volume levels. And not surprisingly, KA-1 is the ideal match for the KC-1 -- functionally, aesthetically, and sonically. Former Clash frontman and punk-rock legend Joe Strummer leads his new band on Joe Strummer & The Mescaleros Global a Go-Go [Hellcat Records 80440-2]. The opening track, "Johnny Appleseed," starts slow and then kicks into high gear at about the one-minute mark. At that point its a fairly complex arrangement of instruments, with Strummers familiarly strained vocals leading the pack. On lesser components, it can all blend together into a blob, but the clean and precise nature of the Kandy gear renders a pleasing view into the recording with very good image separation and clarity. The KA-1 isnt an infinitely airy-sounding integrated amplifier, nor is it one that gives you rich, harmonic textures, but it is exceedingly clean and amazingly precise for its sub-$1000 price. Soundstaging is strong, with a good lateral spread and a reasonable sense of depth. Again, the Kandy gear wont compete against much more expensive electronics that can unravel infinite detail and show a stage spread from here to beyond the walls, but it gives you most of this and does not commit the sin that many low-cost components do -- a flat-as-a-pancake, uninvolving presentation. 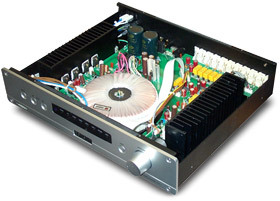 This is a refined amplifier/CD player combination that has good performance across the board. This same music track also highlights a trait in the midrange area and higher frequencies for both the KA-1 and KC-1. This area of the frequency band is certainly easy to discern because it's a tad dry -- definitely not lush, soft or robust. Ani DiFranco, a favorite performer of mine for both casual listening and demonstration, sounds extremely clear here, but on more lush components, her voice can sound softened around the edges. This characteristic is in contrast to an amp or a CD player with a warmer, fuller sound in the mids that tends to make for a more bulbous presentation -- old-school tube amps fall in to this category as do some solid-state amps that try to sound tubey. Audio Aeros Prima 24/192 CD player that Ill talk about below gives that little bit of warmth to its sound too. For those wondering if what Im saying is criticism or praise, consider it what you will. Its a trait in the sound of the KA-1 and KC-1 that some may prefer and others will not, and this may depend on what type of music you listen to. For example, the All the Pretty Horses soundtrack [Sony Classical SK89465] is a warmer, more robust recording with a weighty vocal track by Marty Stuart, "Far Away." Its here that the slightly drier sound of the Kandy KA-1 and KC-1 works in the recordings favor since it helps make the sound more precise and controlled. If you like things fat and underdamped, this may not be your ticket. If you want vivid, incisive, and clean, try some Kandy. Because the KA-1 is not thick- or fat-sounding, in ways it does not sound as powerful as it is -- but thats deceiving. At the point in the "Johnny Appleseed" track where the drummer joins musicians, the KA-1 drives it home with ample power. This is not a romantic, bloomy amp, but rather a more visceral performer that does well with a wide variety of music, including rock and pop recordings. Percussion comes through with a "thwack," not a "whoomp." The sound is a little more up-front and lively, not laid-back and distant. And the KA-1 does this without being etched or too lean, and thats an accomplishment given the low price of the KA-1. As with any audio component, the Kandy series is obviously designed to meet a price point, and to do so, a company has to balance tradeoffs to deliver a product with strengths that outshine weaknesses. For example, Ive heard high-powered integrated amps and receivers at around this price that have loads of features too, but sound awful -- grainy, miserable, and downright unlistenable. The Kandy stuff gets you well on the road to terrific sound. On the other hand, I have heard some simply exquisite-sounding pieces but without the KA-1's power. For example, the French-made $1120 Vecteur I-4 is another fine integrated amp with amazing build and superb styling. Just looking at it, I figured it cost twice what it does, just like the Roksan stuff. However, according to that companys specs, the I-4 only musters 60Wpc; 110Wpc of good power like the KA-1 offers are a lot, and thats a very important consideration if your speakers or room need it. In the end, its the combination of power, features, build quality, and sonics that helps to make the KA-1 a winner when comparing it to similarly priced components. But what happens if you spend a lot more money? Do you get a lot more in return? Well, for a while I used the outstanding Blue Circle BC8 mono amplifiers along with the BC3000 preamp to drive the OM-7s -- the amps alone are about eight times the price of the KA-1! The 225-watt BC8s do sound more powerful -- and they should given their power rating, price, and weight. But forgetting power for a second, what you achieve with a whole lot more money is also more finesse, better resolution, a bigger soundstage, and more you-are-there realism. In essence, a more expensive amplifier can give you more all around. But the KA-1 holds its value against something like the BC8/BC3000 combo because it's a fraction of the price and is powering the speakers amply producing sound has no fatal flaws in any one area. The KA-1 is extremely pleasing to listen to. And when it comes to CD players, what you get as you pay more is less clear. Ive always found CD players to exhibit smaller differences compared to other components. When it comes to features, frankly, its basically all a tie, and Im not going to go there since all these players function about the same regardless of price. But when it comes to sound, there is a little more to be said (although some will try to sell you the line that all CD players sound the same). For those who use a low-cost DVD player for CD source, the clean, clear presentation of the KC-1 will be an ear-opener compared to the thin, grainy sound that some multi-use players can deliver. But comparing it only to something like that isnt right. Where the KC-1 further shows its finesse is against some pricier offerings like Audio Aeros $1695 Prima 24/192. I used the KC-1 in comparison in the Audio Aero review, and vice versa here. In terms of fit, finish, and style, the half-the-price KC-1 is every bit the looker the Audio Aero is and then some. Roksan has done a bang-up job delivering solid pieces of machinery for a low price. In terms of sound, they are very close, but have some subtle differences, particularly in the midrange. The Audio Aero, perhaps because of its tube-based output stage, has a little bit more presence, giving vocals, guitars and the such more body -- but just a wee bit. The KC-1 is every bit as clean in its delivery, just not as full-sounding, and ends up being just a little more precise in its sound, and a tad dry, just like the KA-1. Some audiophiles would argue to the earths end about which one is better. But if a casual listener heard both, he would likely hear nary a difference and save himself almost half the money of the KA-1 (and perhaps put a little bit of toward a nifty faceplate). The Roksan Kandy KA-1 and KC-1 are cost-effective performers that carry on the British tradition for good sound and nice styling and then add a little dash of North American "featurism" thrown in. There are enough buttons on the remote control to satisfy the most ardent button-pushing junkie. Quick, precise, and refined in their sonic delivery, both of these pieces of Kandy dont miss a beat. I figure that many people will likely buy the KA-1 and KC-1 as a system (with, perhaps, the KT-1 tuner) and that makes sense since they are sonic companions. Still, I could see someone going after them separately. In particular, Id say that with the ample power that the KA-1 delivers, along with that abundance of features, it would make a great entry-point piece for someone looking to build a true high-end system. Given its more-than-reasonable asking price, it is a hard piece to keep off your shopping list, and thats what delights me about it so much. One thing is for sure: Roksan has kreated a killer kombo with these two Kandy komponents. Prices: $895 USD for each; $80 for color faceplates.